Summary: This is a short walk but with two distinct features to enjoy. 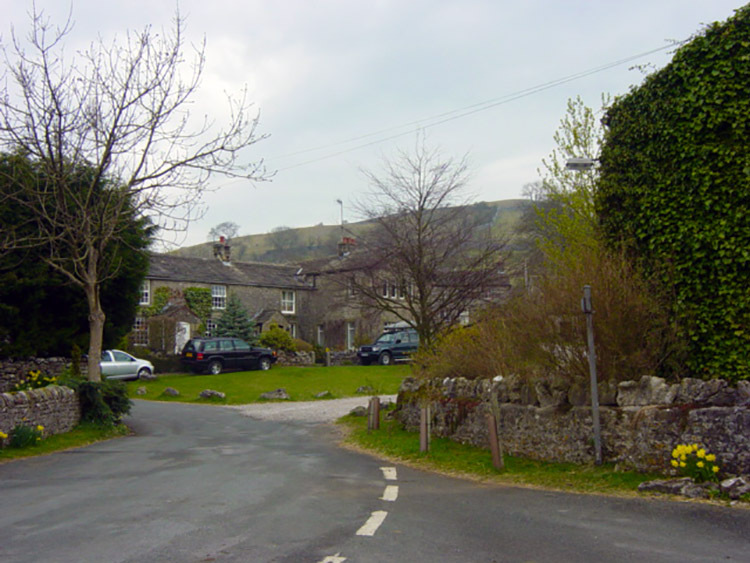 It is an interesting walk which starts from the small Wharfedale village of Conistone ands which begins with an ascent through a spectacularly narrow gorge up to the Dales Way path between Grassington and Kettlewell. 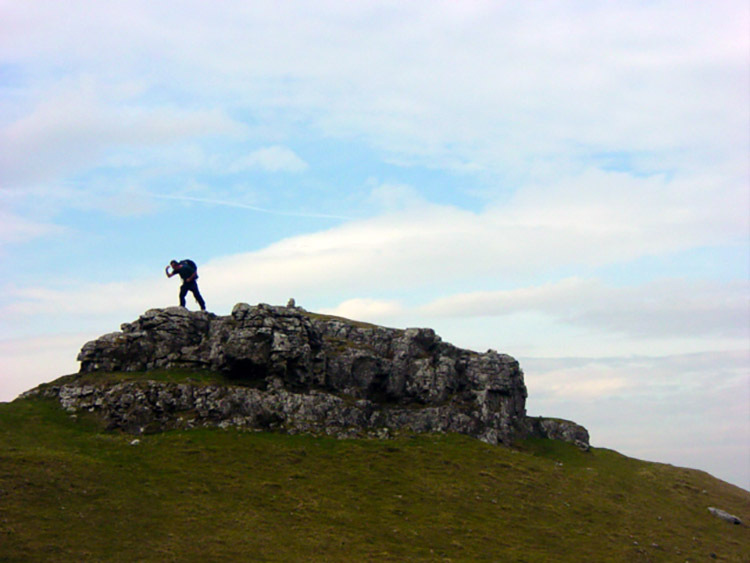 Next to the Dales Way Path we climb to the top crust of a quite unusual pie before returning to Conistone. 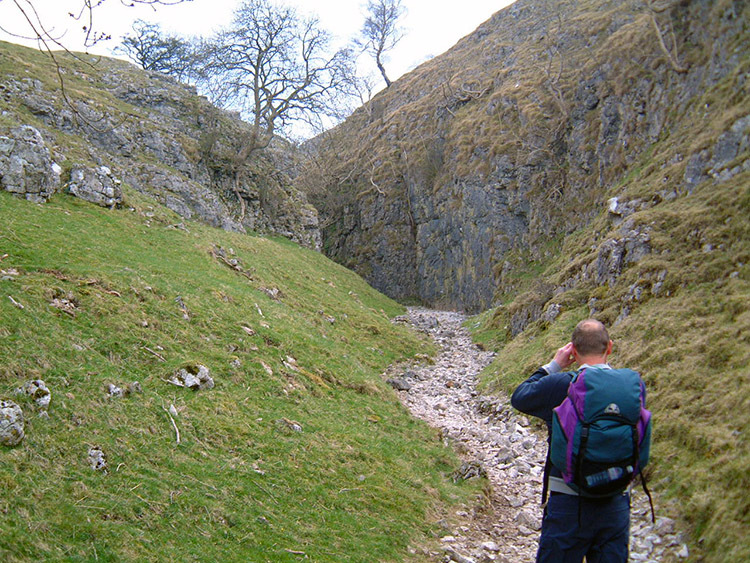 This is a short wonderful walk for all ages and particularly the young explorers who will love entering the narrow gorge just above Conistone village, an enclosed passage between impressive limestone walls that sometimes gets as narrow as a roadside footpath. The walk itself begins right in the centre of the small village and heads from the village eastwards past some cottages, through a gate and along a path straight towards the gorge which is the direct access to Conistone Dib and the higher limestone tables and Conistone Pie which can be seen from the village as you set off. The gorge itself was once a narrow dry melt-water channel called the Gurling Trough. The water is long since gone and the passing through the gorge is now a dry one. Apart from the rock wall there is much interest in the hawthorn and upland flowers and plants that defy gravity to cling to the vertical faces. I am always drawn to look at how they manage such a feat and that makes my walk through the gorge a slow one. I prefer it that way, taking it all in. 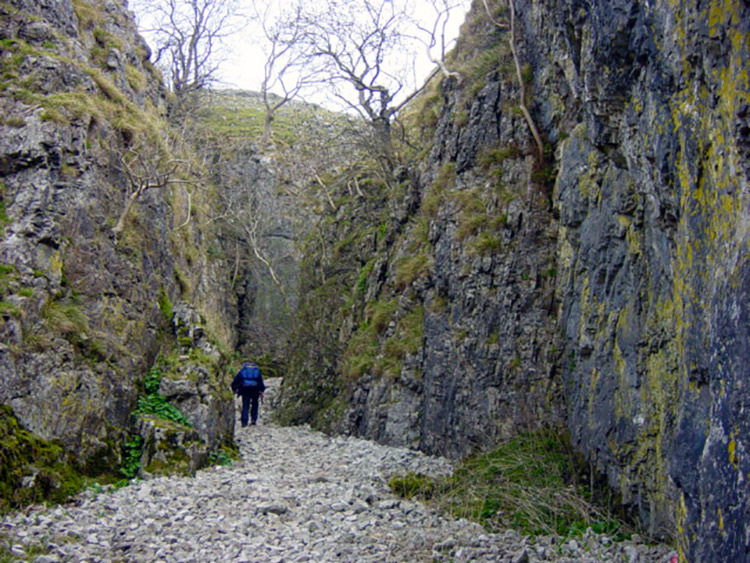 The passage through the narrowest part of the gorge is short but fascinating, as is the final heave out of the narrow path to the more open spaces of Conistone Dib. Erosion to the right has strewn boulders all around and it is an interesting stepping exercise to walk my way around the random erratics. 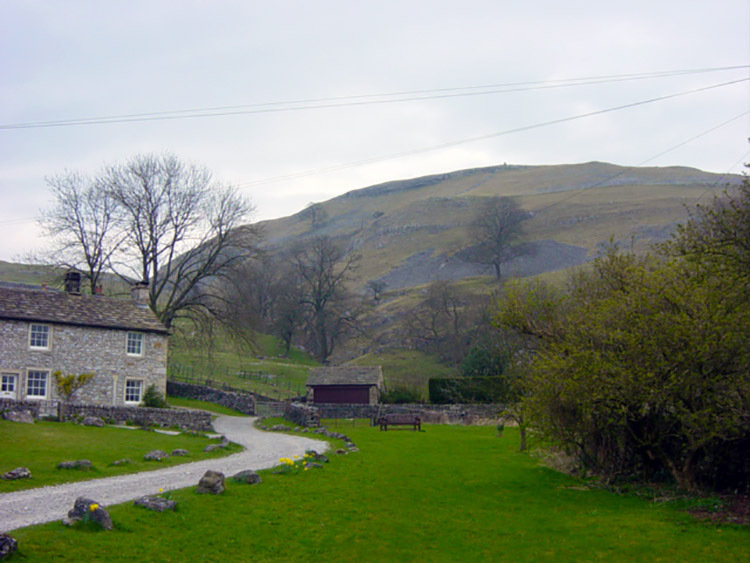 The age long weathering has also caused an impressive scree slope to take shape to the right of the Conistone Dib which with the steep south face makes a natural enclosure. The enclosure has been completed by a strong man made dry stone wall on the north side, all done from the copious amounts of raw material supplied by the long time weathering. 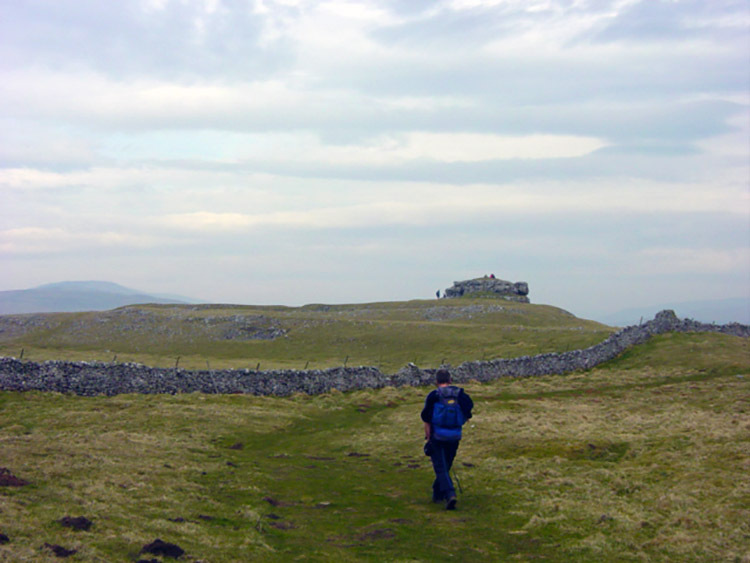 The channel of artificial and natural barriers led me straight up through the carnage of rock to a stepped final climb out of Conistone Dib to emerge on the flat limestone platform which is trod over by many Dales Way Path walkers. 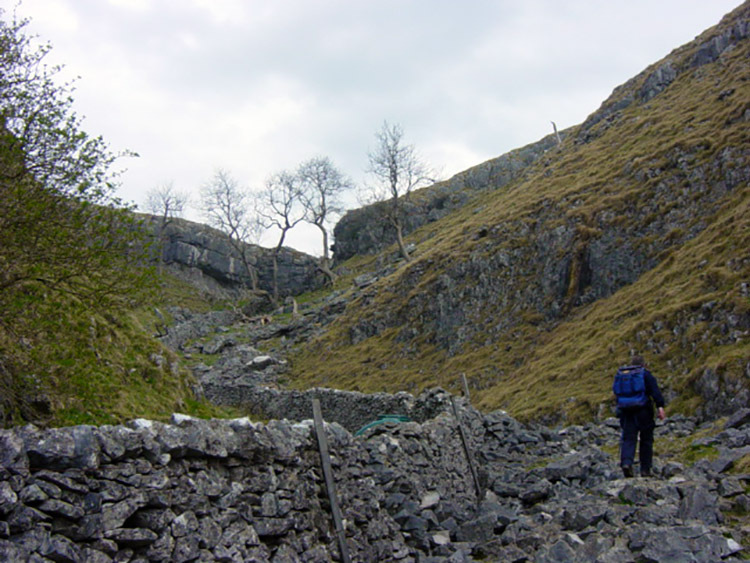 Some will have known about the enthralling characteristics of Conistone Gorge and Conistone Dib to their right but alas more will surely have missed out while following the directness of the Dales Way without seeking the diversion. For those who missed out it is a great shame. 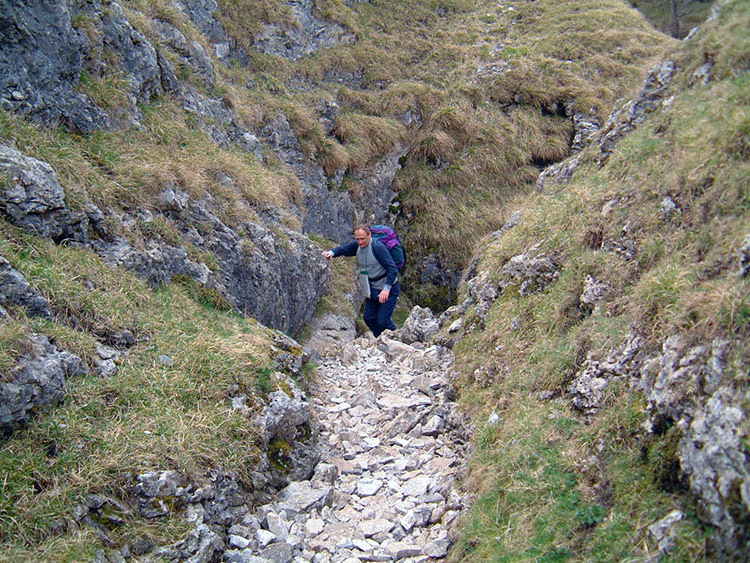 After the exciting challenge of walking through the narrow gorge and Conistone Dib I was already in rapture but there were more thrills to come. The first was already in sight. Immediately on emerging on the limestone platform I could see a striking circular lump of raised ground 300 metres to the north. Some people were circling it while a couple sat on top. I was looking at, drawn to and walking towards Conistone Pie, a feature so clear and not so far off the Dales Way path that many walkers will have taken to detour to and climb it as a photo opportunity, or as a place for refreshment or perhaps both. Who could blame them, not me for I was intending the same. It is an enthralling castled feature, an iconic piece of ground. I decided to take lunch below the west side and sheltered from the breeze while looking out to another remarkable piece of geology in the area, the impressive face of Kilnsey Crag which was facing me directly one mile due west. It was a sight that drew my attention several times on my return journey along Scot Gate Lane packhorse road and past the only blight on the walk, the telecoms mast at Wassa Hill which I suppose is necessary for communications in Upper Wharfedale. It was soon passed and soon forgotten as I continued down to complete my short walk. On finishing I felt like a big kid having had so much fun in the gorge, on the Dib and on top of the Pie!